Bucket List Achievement : Singing With Sigur Rós! 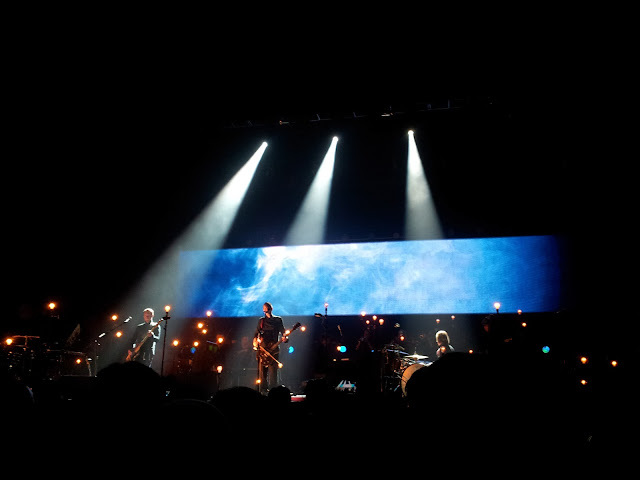 Seeing live performance of Sigur Rós is one of so many things that I want to do before I die. It might sounds so cheesy and overrated. I mean, other people would wondering, what's so special about that Icelandic Band, with spacey-ambient music and the language that you can't even understand? To me, they are so special. Although at first I wasn't really into their music, but after trying to hear them again on the right occasion, I feel that they have 'something'. The music seems so dark and heavy but somehow it's so uplifting. Try to listen Hoppípolla when you're down, it'll uplift your mood, even a bit. Well I actually can't explain it properly but trust me, they really have something. Besides, there's a story behind their songs (especially songs on Takk album), some sweet memories that I can't forget. So, I promised my self that I have to see them, at least once, no matter what. But, living in Indonesia, far far away from Iceland, I always thought that the possibilities to see Sigur Rós is nearly impossible. I always dreamed of flying to Reykjavík to catch their performance, just like in Heima movie, which is too dreamy to come true. And then I heard that they'll come to Singapore and Malaysia, just 2 hours from Jakarta. But yeah, classical financial problem made it was impossible for me to fly there. I could only feel envy to all people that came to the show, and feel sad seeing all photos that they uploaded on Instagram. Then I prayed, "God, bring them here, will you?". Then just like a dream came true, one day in January, I heard that they'll come to Indonesia. Without any hesitation, I bought the ticket and (not) patiently waiting for May to come. The concert was held in Istora Senayan. It was way too beautiful it's so hard to choose the right words to picture how the concert was. But I'll try my best to describe it. Sigur Rós really know how to fascinate their fans, both on ear and eye. Beautiful sound combined with beautiful stage performance. The lighting effect and stunning visualization on the back screen made me feel like in another world, somewhere far far away. Their heavenly voice made me feel like I was in a dreamland. The ambience when we were singing along during Olsen Olsen, and the happy smile of Jónsi brought a goosebumps feeling. The beautiful firework visualization on Hoppípolla made me cry happy tears. I would say that "Inni mér syngur vitleysingur!" which means "within me a lunatic sings!". It was really beyond my expectations and it worth every penny that I spent. No one should ever take Sigur Rós for granted, considering how rarely they would travel, one should get the chance to see them at least once in a lifetime. During the whole concert, I was waiting for my favourite song Ágætis byrjun (a good beginning). Which sadly wasn't played that night. I couldn't move my body even a step from where I stood, hope that they'll come back again to the stage and play one or two more songs. But sadly, the magical tour to dreamland was officially ended. Eventhough Sigur Rós didn't play it, I'll always believe. That night was Ágætis byrjun for me. I don't know from where I got the power but that night I was brave enough to do something that I always afraid of. I've finished all the unfinished business, and with a full hope start a new beginning. And I hope that I'll do better this time. I'm pretty sure with this because I know that God and universe are always with me .I might not get what I want, but God and universe sure will surprise me with their secret plan, which I believe will be way more beautiful. Aamiin.